The giveaway is now closed, but please keep reading to check out this great company and read my interview with the founders! Today is FUN because I get to introduce you to a super cool company, share a fun interview AND do a giveaway! Q Squared NYC recently reached out to me about working together. Now, I get a lot of emails about a lot of products everyday, but Q Squared really stood out. I clicked through and discovered a small company with really beautiful products as well as a fun story. I was super excited to find out more about them and was so happy that they got in touch with me! I don’t know, guys, but these just might be my two most favorite plates ever in the history of the world. Just sayin’. 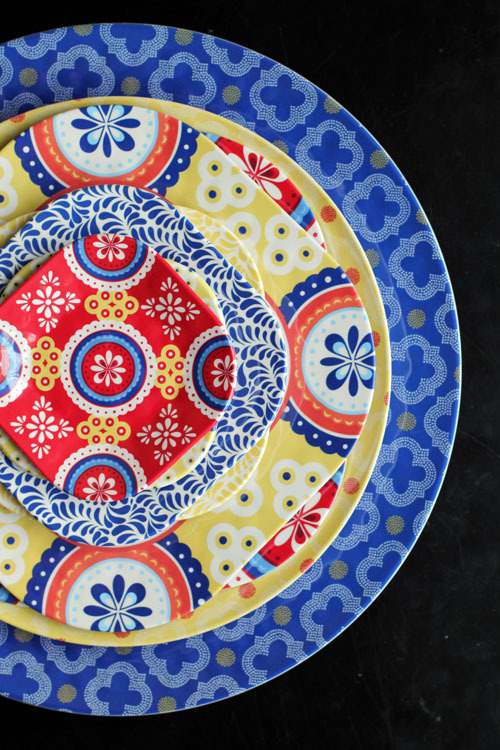 First, before we get to anything else, just look how cute their dishes are. 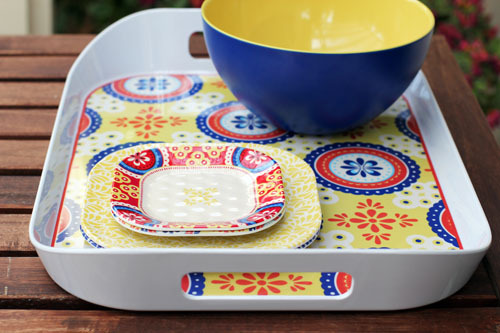 Q Squared sells melamine dinnerware, drinkware, flatware and great serving platters. Everything is beautifully designed and appeals to all kinds of aesthetics, from classic to modern. I am a firm believe in using beautiful things on a daily basis, plus I have kids, so beautiful dishes that are also practical? BINGO. We also love eating outside. 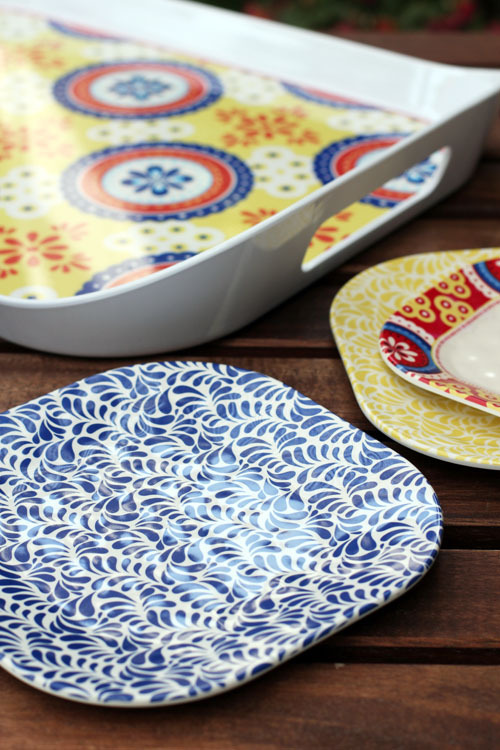 Q Squared’s dishes really are perfect for our family! All of the dishes you see in today’s post are from the Montecito line, which I can’t get enough of. We already have white and blue dishes in our everyday collection, so I knew that Montecito would fit right into our kitchen. The Provence blue flatware and blue tumblers also go perfectly with these dishes and I’m loving it all. You can tell that the products are high quality – nice and sturdy with a good feel. I’m ready to party! I mentioned that Q Squared has a fun story. 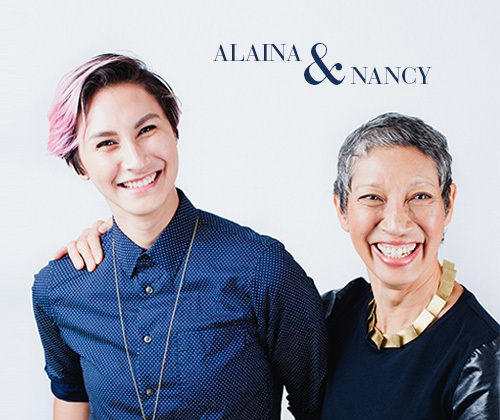 The company is founded by a mother-daughter team, Nancy (the mom and former Glamour editor) and Alaina (the daughter). I had the chance to do a little interview with them and would love to share it with you. I especially love the story behind the inspiration for starting the company. So cute! 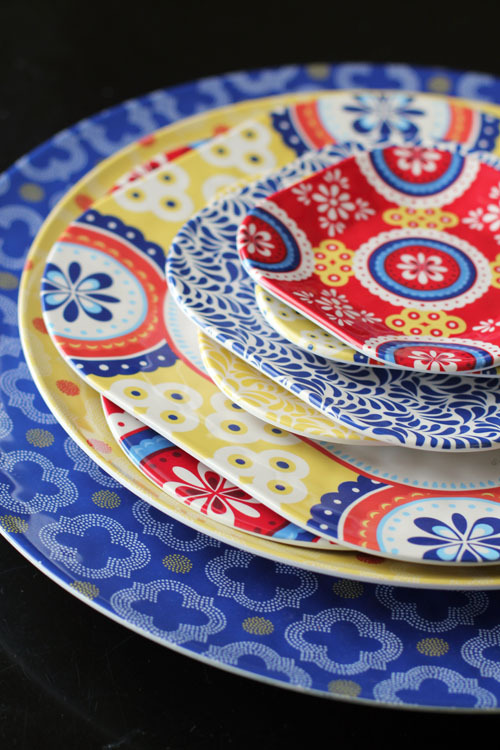 Q: What inspired you both to start a company making dinnerware? Do you love cooking or entertaining or was it just a fun way to channel your creative energy? The answer is a little of both, plus a third reason. We do love cooking and entertaining, and we both feel very creative. Alaina has a critical eye for art and Nancy is a fan of fashion. The third reason, though, was not being able to find beautiful products that were practical and affordable. After college graduation, we went shopping to set up Alaina’s first apartment. She has a very high standard aesthetically but was on a low budget. Everything we came across that had an aesthetic Alaina liked was either China or Porcelain, with the China Cabinet price tag to match – so we created our own company and products to fill that need! Q: Your about page says that while you have complimentary styles, they are distinct. What are Nancy and Alaina’s different styles? Nancy is modern and minimalistic, while Alaina is classical and ornate. Nancy likes bold colors and Alaina likes more muted colors. Combining the two styles results in our refined look that bridges a generation gap. We like to call them generation-less. Q: What is your design process like? Alaina is the Creative Director, so the designs originate from her and her inspiration. Her inspiration comes from the past, whether it is history in general or her own personal history. Nancy’s input to the designs helps guide the collection toward what would be most widely appealing to our consumers. 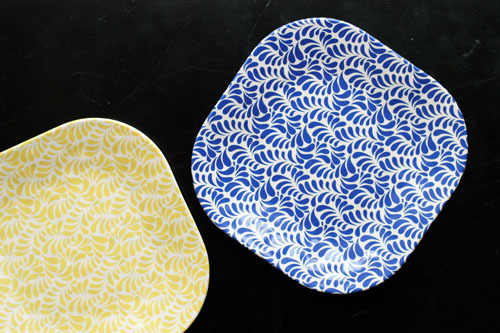 Q: Do you see yourselves moving beyond dinnerware one day? Yes, absolutely! We are launching our first new product category (home fragrance!) in Summer 2014, with the continuing expansion into Fall/Winter 2014. Looking into 2015 and beyond, we will continue to introduce more home decor products, including gifts, decorative accents, textiles, etc. I hope you’ve enjoyed being introduced to this great company, its founders and their beautiful products. Good luck with the giveaway! This post was sponsored by Q Squared NYC. As always, all opinions are 100% my own. Leave a comment on this post – that’s it! If you would like, tell us your favorite collection on Q Squared NYC! The winner of the giveaway was Debbie Rough, who said, “Love this same pattern you have. Need a new tray”¦ Mine just broke!!!! Woohoo hope I am a winner” Congratulations to Debbie! You will love your items!